This post is a bit late today due to poor cell phone Internet connectivity at 5:30A.M. this morning...absolute horrors! Ta daaaa! What do you think? I thought it would be nice to have a little family picture wall starting with a wedding photograph of Jeff and me surrounded by some of Milton's most memorable photographs. I think it turned out well as an "Ode to Milton"; Jeff thinks it looks more like a shrine...! In case you are wondering, yes, that is an old telephone stand in our hallway. It lends a little bit of charm. On another note, here is Milton lying on our brand new rug. Jeff actually pulled this rug, all grimy and gross, out of the attic, and I cleaned it up. It was quite the find! 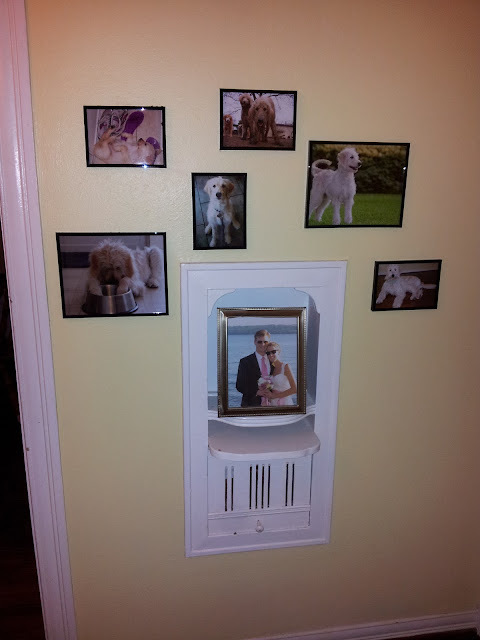 LOVE the "photo feature wall", I have one of those in my office where no one is brave enough to say anything about the number of photos of my dogs vs. the number of photos of my children. I adore the old world charm of your new home; I'm so envious! Love the pictures. 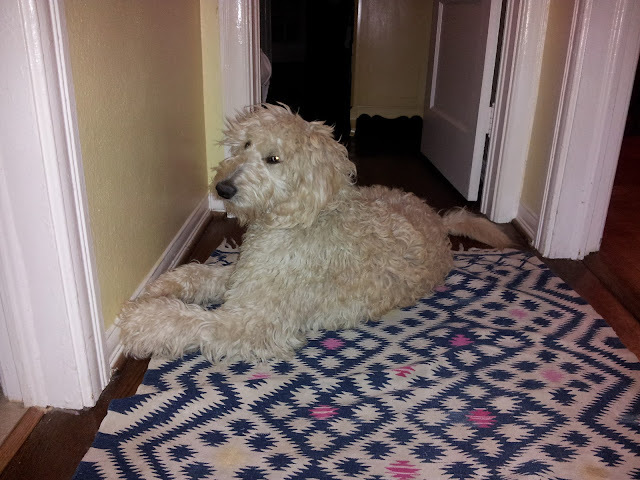 The "new" rug sets it off especially since Milton likes it.